NEW! Live Premier League text service! Win a £500 Phone & Chance to Win WC Tickets! Official Premiership Talk fantasy league is launched! Prizes to be won! Signed Ronaldo Jersey Up for Grabs!! Premiership Talk is on Facebook! 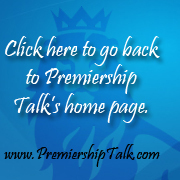 Premiership Talk has a new look!